(CNS): The problem of rising crime in the Cayman Islands will be a priority for him, the new governor has said. Speaking to the press immediately after swearing his oath of office on Friday afternoon, 15 January, Duncan Taylor said that law and order underpins a stable democracy. As an area that was his responsibility, he said he would be working with the commissioner of police to address the security problems currently facing the islands. He said he would also be getting out to the districts as soon as possible where he could hear directly the major concerns of the wider Caymanian public. “As governor I do need to understand the people’s concerns,” he said, adding that he was aware that crime was a pressing issue, and with security falling within his direct area of responsibility, he had an obligation to address that. Taylor added that he was looking forward to working with the commissioner and hoped that some of his previous experience would be helpful. “My experience of working in small Caribbean island communities on issues of mutual interest, for example, in the fight against drug trafficking and associated crime, may prove helpful to me here,” he told the Legislative Assembly during his formal presentation. During the 30 min press conference, he also acknowledged the controversy that had surrounded the special police investigation, Operation Tempura, and he said he would be discussing the current situation regarding Operation Cealt with the police commissioner as soon as possible before considering the way forward. “I am well aware of the degree of concern about it,” he said. Taylor also told the media he was aware that the relationship with the UK and the Governor’s Office had been impacted as a result of that and the circumstances surrounding the global financial crisis. But he was going to do is best to rebuild a good relationship. Taylor told the press that he believed the relationship was not broken but there had been difficulties. Promising to be enthusiastic, open and accessible, he said he hoped that his appointment demonstrated that the UK had Cayman’s interests at heart. 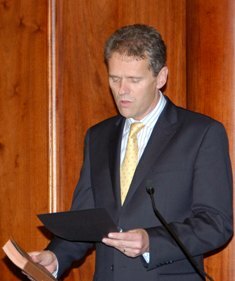 The Cayman Islands eleventh governor, Taylor became the first to swear, during the oath of office, that he would serve the interests of the people of the Cayman Islands. During his address he acknowledged that changed position as a result of the new Constitution. Acknowledging that reference, he said he knew he was here to serve and not rule. However, the issue of good governance was at the forefront of his speech to the LA, and despite the new oath, the Constitution still acknowledges the UK’s priorities and contingent liabilities. Taylor said that while the phrase “good governance” may get bad press, it was, rightly, a key theme throughout the overseas territories. Good governance, he said, was about respect for the rule of law, underpinned by an independent judiciary; transparency, and accountability with institutions, the legislature but also the private sector. In light of the premier’s recent call to the governor not to micro-manage, Taylor said he had no wish to do that as the UK government had made it clear since 1999 that it wanted the overseas territories to have “the freedom to run their affairs to the greatest extent possible”, and where there was good governance, partnership and cooperation would flourish and a governor could operate with a light touch. 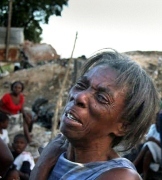 (Jamaica Observer): The Caribbean Community’s emergency aid mission to Haiti,comprising heads of government and leading technical officials, failed to secure permission Friday to land at that devastated country’s airport, now under the control of the USA. Consequently, the Caricom "assessment mission" that was to determine priority humanitarian needs resulting from the earthquake disaster last Tuesday had to travel back from Jamaica to their respective home destinations. Last evening, the frustration suffered by the Caricom mission was expected to be raised in a scheduled meeting between Jamaica’s Prime Minister Bruce Golding and US Secretary of State Hillary Clinton.